As it is reported at the office of Patriarchal Curia, letters started being sent last month. 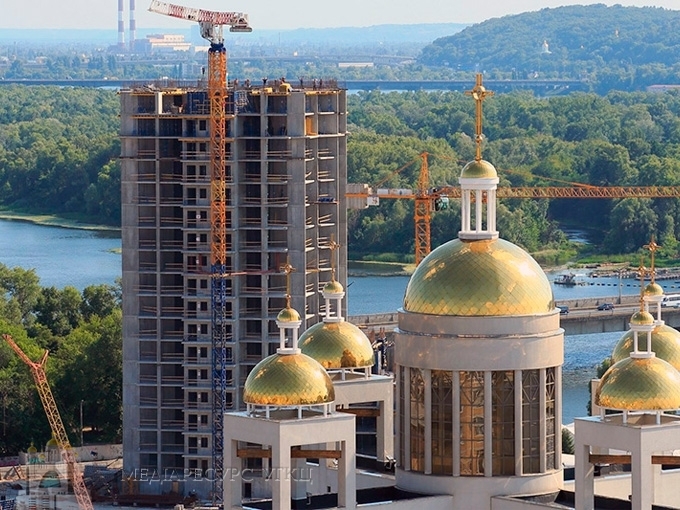 More than 36 thousand of appeals of Ukrainian citizens who demand to stop illegal process of building at Dnipro river bank nearby the Patriarchal Cathedral of the UGCC have been already registered. These letters keep coming and will be passed to its recipients. “We inform about a Demand of Ukrainian citizens, faithful of the Ukrainian Greek Catholic Church purposely to stop illegality of building a housing and office complex between Mykilsko-Slobidska St and Brovarskiy Avenue, Dniprovskiy region in Kyiv what is being constructed within a riverside area of Dnipro river as well as in a zone of a landscape protection and a neighbouring territory of Patriarchal Cathedral of the UGCC”, is said in the letter addressed from the office of Curia to the authorities. As it was mentioned by fr. Vasyl Chudiyovych, chancellor of Kyiv Archeparchy, with numerous violations of the law, agreed with dishonest people the target purpose of plots that are contiguous to the Patriarchal Cathedral was changed. “Being prescribed by law, the width of the protective riverside was also changed from 100 to 50m. We cannot tolerate illegality what can lead to the destruction of the cathedral, that is why we must insist on upholding a legality at the building and adhering by a builder to all city planning instructions. Everything what happened or has been happening so far must not be legalized!”, the chancellor stressed on. It is worth turning attention to a started by activists electronic petition on the President of Ukraine website: “To defend Patriarchal Cathedral of the UGCC from the destructive influence of illegal building of a housing and office complex between Mykilsko-Slobidska St and Brovarskiy Avenue, Dniprovskiy region in Kyiv”. There 40 days left to so this demand takes 25 thousand of required votes for President’s due consideration. The Patriarchal Cathedral of the Resurrection of Christ is the main cathedral of the Ukrainian Greek Catholic Church. Throughout its building Church authority refused help of big business and high-ranking persons. Former Head of the UGCC Lubomyr Husar said the next: “We support a position of not accepting donations from officials as it is always provoking a so-called “gratitude”. We want to be a Church what is free, where donations do not prevent us from telling the truth when it is needed to be said”. Every Greek catholic in Ukraine, as well as from diaspora had an opportunity to contribute to the process of building the cathedral and felt their participation in developing our Church. Clergy of the UGCC together with its faithful organized different entertainments, benefit concerts. Later on, collecting donations was made by spreading so-called “bricks” which Greek Catholics could buy not only in Ukraine, but also in Poland, Germany, USA, Canada, Argentina and other countries around the world. In such way, faithful of the UGCC all over the world contributed to building the Cathedral, still continue making their enormous investments in this common cause, wishing to satisfy religious needs. We feel concern for a building activity of “Sunny Riviera” what is too close to the property complex of the Patriarchal Cathedral of the UGCC as this activity is considered to be unregulated, irregular, violating the law, city building norms and regulations, what, probably, led to the evidences of destruction of the Cathedral and in a nick of time it might lead to the inevitably negative technological consequences both for the Cathedral and a living environment around. A technological danger goes on the same level with morally ethical consequences of an improper usage, notwithstanding interests of society, neighbouring plots of the Cathedral within a protective riverside what contradicts law norms. We demand relevant state institutions to make building company adhere law and all procedures steadfastly, what is foreseen by city planning regulations of Ukraine. Only in this way we can avoid the destructive influence of a building nearby the Cathedral area. This interest, legally protected goes out of fundamental liberties and beliefs of a human.